I'm not always the best when it comes to keeping people in the loop, so here's my way of making it up to those following along. The next few posts will each be centered around a location, or region, and a selection of photos from these areas. There will be more posts coming in the next few days as we are resting in Georgetown, Malaysia. I will also be "unveiling" a travel portrait project I'm piecing together. Enjoy the photos! 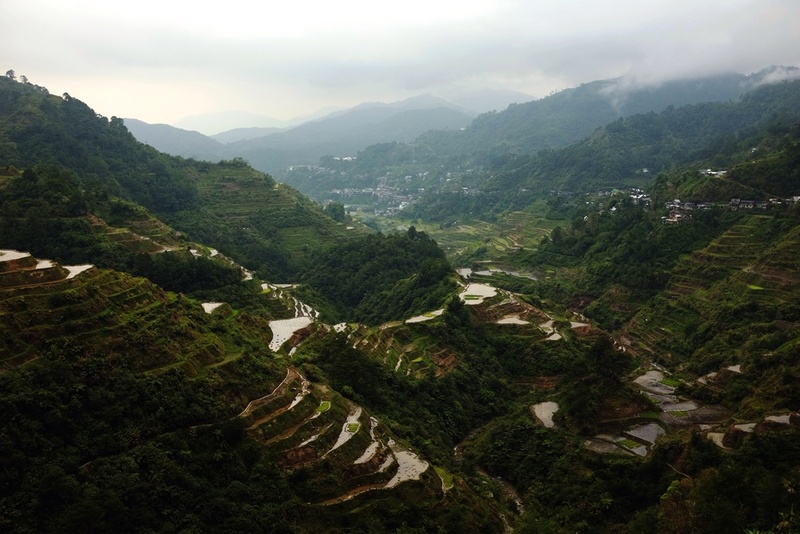 Today's post is a follow up to my last one from the rice terraces in Batad and Banaue. The view as we descended into the Batad rice terraces on our way to Tappia Falls. The tour group as we trekked across the terrace dikes in Batad. Rice clumps ready for transplanting and spreading out in the next step of the cultivation process. Tappia Falls. Cold swimming and beautiful views. Our treat after trekking through the rice terraces. The wifey and I in Banaue. Some photos from our visit to the rice terraces carved into the mountain sides of Banaue and Batad. Built by the indigenous tribes of the northern Cordilleras, the rice terraces are on the same ancient engineering scale as the pyramids of Egypt. Irrigated by tapped mountain springs and streams that are fed into a complex system of canals, the locals have been growing their rice here for over 2,000 years. Truly a fascinating experience to view and trek through. And a tip for those who visit, go with the municipal tourism group. They employ natives who are extremely knowledgeful and helpful. Also, there are no hidden fees, which you'll find with many of the non-authorized guides. Ask for Nathan Cabbigat of you can get him - he's an awesome dude.